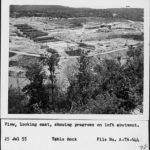 After the 1959 completion of Table Rock Dam, significant changes were in store for the Branson area. 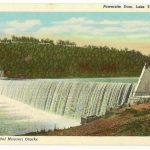 Damming the unpredictable waters of the White River created a massive, warm-water recreation lake that became a major draw to the area apart from the fledgling music industry. It also created a new lake – Lake Taneycomo – a colder body of water, ideal for cultivating trout fishing; both rainbow and brown trout are released into the lake from the Shepherd of the Hills Fish Hatchery, making it another excellent addition to the tourism industry by bringing in fishermen from around the country. Table Rock Dam is impressive; it measures 6,423 feet in length and rises 252 feet above the riverbed. The gorgeous and clear waters of the lake are perfect for nearly every type of water recreation you can imagine…swimming, skiing, fishing, parasailing, jet-skiing, flyboarding, and even scuba diving. Diving in Table Rock Lake may be one of Branson’s best kept secrets. When the Dam was constructed, the small village of Oasis was evacuated and its remains still lie below the surface. 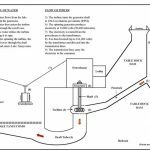 Local diving experts can help you find landmarks from the village, as well as several sunken boats in the lake, including a twin-deck riverboat and a 40 foot cruiser. 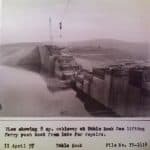 It was one of four dams authorized by Congress in 1941 to both control flooding in the region, and generate hydroelectric power. Another of the dams is also located in the area; Powersite. 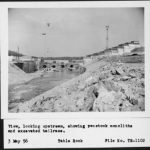 Table Rock Dam contains 1,230,000 cubic yards of concrete and 3,320,000 cubic yards of earth embankment. The name “Table Rock” comes from the original site selected for the dam — Table Rock Mountain. After determining the site wasn’t stable enough, it was moved, but the name remained. 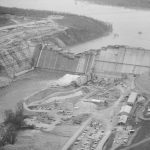 The lake created by the dam covers 43,100 surface acres and possesses a massive shoreline of 745 miles in Missouri and Arkansas. 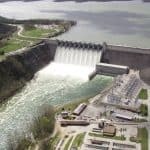 Branson is the main attraction for tourists coming to this part of Missouri; however, prior to the construction of Table Rock Dam, the biggest reason everyone came to the area was to stay in Rockaway Beach. The waters of the White River flowing through Rockaway were warm; swimming and other water recreation was popular there, and many small resorts and hotels would fill up during several months of the year. 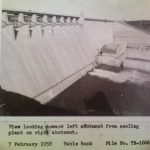 Because the water pulled through the dam from Table Rock Lake comes from the bottom, it’s cold; this means the water going into Lake Taneycomo and on down to Rockaway Beach was no longer suitable for swimming. Today, Rockaway Beach is known more as an ideal place for fishing. 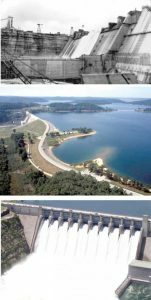 You can drive across Table Rock Dam and learn more about it and other aspects of Table Rock Lake by visiting the Dewey Short Visitor Center. The visitor center contains many fascinating displays, has a small theater for viewing historical films on the lake and dam, a great gift shop, and offers beautiful views of the lake and dam. For more information on where to stay near the Table Rock Dam, contact Branson Tourism Center at the number below.